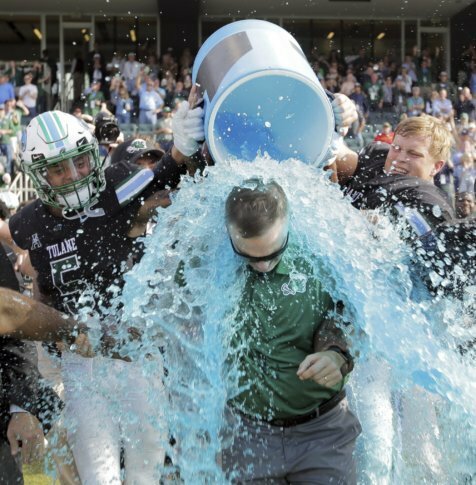 NEW ORLEANS (AP) — Tulane coach Willie Fritz looked at the man who’d hired him to turn the Green Wave football program around and held up two fingers. “We were doing really well offensively. Our defense was kind of tired,” Fritz said. “I went over and told the AD I was going for 2 — just wanted make sure I still had that contract. The game-winning score completed a seven-play series that covered 71 yards in 2:11. It came in direct response to Tazh Maloy’s 9-yard TD run, which capped a string of 25 straight points that turned Navy’s 21-3 halftime deficit into a late, 28-21 lead. “Our loyal fans — which we’ve got a ton — they’ve had some tough times here, and it’s about time we got the opportunity to win and celebrate like that,” Fritz said. Zach Abey passed for a 73-yard touchdown and caught a 37-yard scoring pass — a sudden surge from a passing game that ranked last in the nation coming in. “Obviously, that’s not really who we are, but in the time of need, we needed to do that and it showed that we were prepared,” Abey said. Abey finished 7-of-13 for 167 yards, including a fourth-down completion that kept alive Navy’s go-ahead scoring drive in the fourth quarter. Sean Williams’ interception and 36-yard return to the Tulane 7 set up a short field goal to ignite Navy’s second-half rally. Next came Malcom Perry’s halfback pass across the field to Abey. Tulane responded by driving into Navy territory, but Merek Glover’s 32-yard field goal attempt hit the right upright, setting up the roller-coaster of finish. Tulane: An enthusiastic crowd on senior day looked and sounded incredulous as chances for a first bowl in five years seemed to slip away — all because of big passing plays by a struggling Navy team that hardly throws and hadn’t won on the road all season. But the Tulane faithful were jubilant after the Green Wave offense regrouped just in time. The Wave defense sold out to stop the run, holding Navy to 117 yards rushing, 187 yards below its average coming in.